A few weeks ago, I volunteered to go help rice local rice farmers plant their crops. Though Japan in general is famous for rice, Akita in particular takes pride in the quality of its crops. (So far I’ve learned that Akita rice and Akita sake are top notch.) This has been one of my favorite experiences since coming here, and I’m glad I get to share it at last. 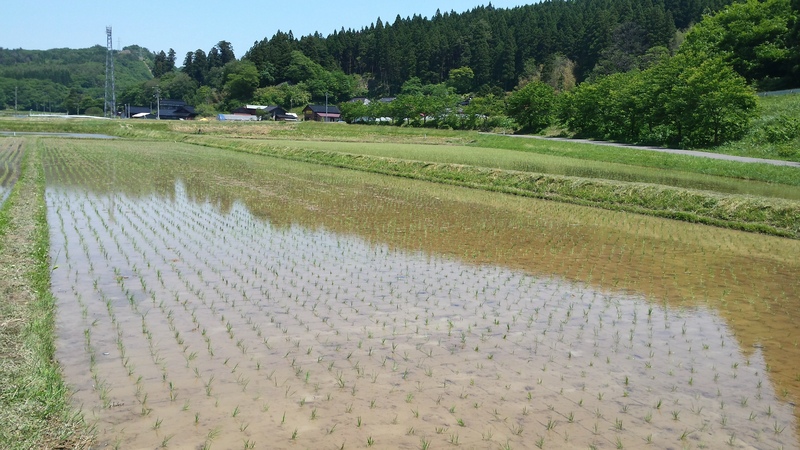 Rice planting or “taue” takes a lot of skill and a lot of hard work. It’s difficult to imagine smiles being part of the process at all. Later that day, cool mist from that waterfall tickled my face. The sharp, slippery rocks in the riverbed cut into my feet as I trekked through the frigid pool in search of anything defiling this sanctum. I can recall the moment I stubbed my toe. My heart leaping into my throat, I grappled for anything around me. 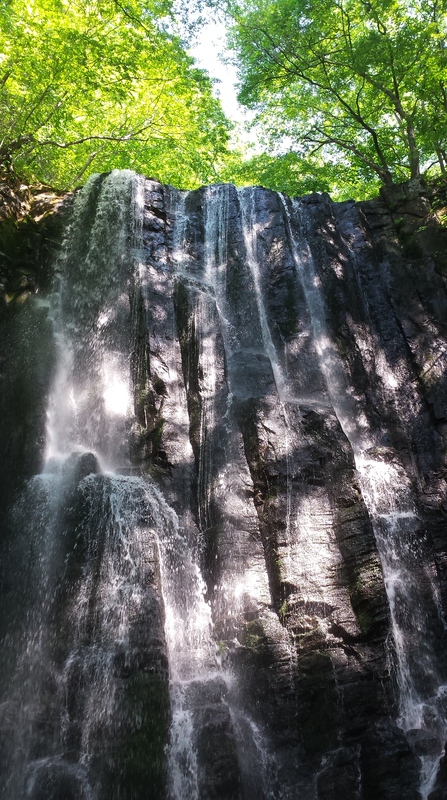 My hand brushed a tuft of soft foliage growing on a nearby stone and clung to the lush greenery before I could tumble face-first into the pool. My group laughed. Any other day I would have hid my face, focused on the pounding of my heart or the pain in my toe, and shut myself out of their prying eyes. Instead, I reached for the massive branch blocking the flow of the river’s water. My goal. With a heave, I tossed it back to shore, flinging water and algae at the bystanders. “I’m just fine, guys!” I caught myself. Earlier, I remember groaning as I trudged through a pool of mud, each step more cumbersome than the last. Sweat tickled my neck, distracting me from my work. I took a step and suddenly, I felt the world around me spin. Flailing, I groped the air, expecting some sort of miracle. And somehow I found one. Gravity righted itself before I could tumble, and life went on for a moment longer. As I neared the end of the row, I dragged my boots behind me still slower, now coated in layer upon layer of mud. I needed to wash them. I needed to rid myself of the extra weight somehow. Behind me, the rows of “rice-lets” lay scattered in an off-kilter line. I noticed an older gentleman beside me, his wrinkled cheeks raised in a secretive smile. He turned his head downward and returned to his work, back bent, rice in hand, stepping through row upon row of “rice-lets” without ever once disturbing their rest. Perhaps with age comes magic. The weight of the boots disappears, I thought. I looked down at my own attire, splattered in mud from rescuing my lacy sunhat before it could fly off into the murky depths. As our group leader called for a break, I finished my second row and hurried towards the running water to clean my boots at long last. But then a thought struck me. I watched my group leader padding through the grass, her feet bare and backside covered in mud. She danced next to the paddy, snapping pictures of us as we guzzled green tea. I struggled to remove my own boots. For several minutes in fact. I tugged and tugged until at last I felt freedom. I hurried back to the field completely revitalized. Perhaps it was the green tea. Perhaps it was my imagination, but as I slid my bare feet into the mud, the sweat on my back disappeared and a cool sensation replaced it. I sunk to the bottom, but I felt as if I could float on top. The rice slept quietly between my feet. The mud slid through my toes instead of clinging to my skin. And all too soon it ended. I stood before a glorious paddy painted almost gold as the water reflected the sun’s light. The rows seemed a bit straighter, even the ones I had planted. We huddled around the flowing water, scrubbing our feet and hands and boots and clothes. We shot pictures of the fruits of our labor and documented our fatigue. I couldn’t stop. I knew I could plant more. I could plant it all. I caught the old man’s smile again, his gaze set on our hard work and his own friends. A lifetime of planting, growing, harvesting, sharing… He still captured the beauty of it all through the grime, the sweat, the dehydration, the fatigue. As we returned home, the savory smell of roasting port greeted us before we could step through the door. Adorned in bandanas and aprons, short village mothers scurried through the kitchens. They chitchatted almost like birds, carrying plates of vegetables and onigiri to and from the dining hall. The men gathered in their own corner, chatting about the day’s work no doubt. My group occupied the bathrooms, changing out of mud spattered clothes, filling up water bottles, scrubbing fingernails. Again. I picked at the grime under my own fingernails and decided to keep it. A little extra minerals with lunch never hurt anyone. I think. I wish I had prepared myself for the pain though. Not the pain in my legs or my back or toe. That sort of pain seemed pleasant, almost like a reminder of my accomplishment, my hard work. I wanted it to stay so I wouldn’t ever forget. But the longing. I remember longing for Takinomata as I longed for Mitaka. But I longed for more than just the place. I longed for the mud, the smell of pork, the smile of an elderly farmer, the suspense of almost falling. I still don’t know how I caught myself.